As a firefighter on a hotshot crew, you’re a professional hiker. You will scale mountains, slosh through streams, cross boulder fields, and trudge and march through some of the most miserable terrain America offers. This is what makes the job fun. After hiking for an hour or two, you’ll then be expected to cut fireline. Then, when you’re thoroughly exhausted, you will hike home. Bottom-line: If you can’t hike with the crew, you don’t deserve to be on the crew. Hiking with a pack over broken terrain isn’t something that you can just get off the couch in May and start doing well. You must train for it. Furthermore, “The Pack Test” doesn’t come close to simulating the training hikes that you’ll do on a hotshot crew. Just because you walk across flat ground for 45 minutes with a 45lb pack, don’t think you’re ready for the rigors of the fire season. To help you get ready for the season, we have built a training plan that’s designed to complement your running workouts. Stick with this plan and you’ll show up at your duty station ready for the season. The best way to improve how fast you move up the mountain is to get on a mountain and start walking up. That’s not always possible of course. But if you’re training for the fire season, you should be wearing a pack 2-3x a week and doing everything you can to get your boots on a trail. There’s no question about it – hotshots are professional hikers. So you better train for it. In the training plan that follows, Tuesdays and Thursdays will always be hiking days, while Saturdays should be spent doing prolonged, all-day athletic activities (Long trail run, epic hike, mountain biking, snowshoeing, cross-country skiing, orienteering, ultimate Frisbee, pickup basketball, etc.). Hunting Elk also counts. Ice fishing…not so much. Something to consider purchasing is a weight vest. They’re comfortable, and a better alternative to stuffing your pack with rocks at the trail head till you ‘reckon you got about 50lbs worth of stones in it. A better solution to purchasing a weight vest? MAKING YOUR OWN! For all the do-it-yourselfers out there, we’ve put together a simple plan for creating a training ruck that perfectly fits the requirements of the hiking training system, and can be used to train for the pack test. Check it out. All hotshot crews use the same type of training hikes: Long and Steep. You will start at the bottom of a mountain and hike for 45-60 minutes straight up it. You might very well do a bunch of push-ups when you get to the top too. If there are any stragglers, you will circle back and hike with them back to the top. More often than not, these hikes were made by previous crews during line-cutting training, so don’t expect switchbacks or mild grades. Imagine watching someone roll a boulder off the top of a hill. The boulder’s fall-line will be the path that you’ll take to the top. To best prepare yourself for the upcoming season, scout out your area for a good hill. An ideal training hike will be 2 miles, gain 700-1000 feet of elevation, and have a minimal number of flat or downhill sections that you might be able to recover on. But, if your part of the world doesn’t offer such hilly topography, don’t despair. Hike the hill that you do have 2 or 3 times in a row to compensate for one long sustained hike, or substitute in some of the exercises below. The training guide offers a hiking schedule to get you into shape. Remember to hike in your fire boots as well – not only do they add an additional 3-4 lbs of weight, but you want your boots well broken-in by the start of the season. Hotshots don’t skimp on their socks either. Check out SmartWool’s Mountaineer Socks. SmartWool makes the best socks on the market. Your blister-free feet will thank you later. Hotshot Fitness also recommends White’s Boots as the best boot on the fireline, bar none. The Smokejumper model is a tried-and-true classic. Worth every penny! Invest in a good pack. After doing a GORUCK Challenge in Phoenix, and learning more about the craftsmanship that goes into every GORUCK pack, we have become ardent supporters of GORUCK products. All their gear is made in the USA, built to withstand the rigors of combat, and used globally by mountain rescue teams, special forces soldiers, and weekend badasses like you. We highly recommend the GR1 and GR2 for your go-to training pack. They’re tough as nails, built to last, and look good on the trail should you come across any ladies. The GR2 is 40L, while the GR1 is 26L. Firmly believing that bigger is better, we like the versatility that comes with a larger pack, so we prefer the roomier GR2. But if you’re just going to be packing it with our training blocks, the GR1 will give you plenty of room, fits a hydration bladder easily, and allows for plenty of space to stash a jacket and some food. Plus, you’ll save a few dollars by going with the GR1. Bottom-Line — GORUCK packs are the best on the market. We swear by them. Get a Hydration Bladder. Fumbling with the lid of a Nalgene bottle while trekking is a problem of the 90s. CamelBak fixed that, and made drinking and walking a painless activity. Invest in one. Almost all packs nowadays come with stash spots for water reservoirs. 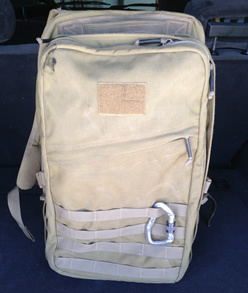 If you’re using a GORUCK pack, the CamelBak Omega Water Reservoir is a solid pick up. You can vary the length and time of your hikes, but shoot for at least 45 minutes, minimum. Most hotshot training hikes last between 45 minutes and 1.5 hours, so be prepared. Hey guys, I’ve been rated qualified and refered as a hotshot in vale OR, Susanville CA, and salt lake city UT. My question is if I get the job when would I be reporting for work? I would be relocating from Florida so id need a rough estimate, so I can plan my finaces, and lease terms for the remainder of my time in Florida. Also any input on exactly what it means to be rated qualified and referred would be much appreciated. Does it mean I have a good chance of making it, or does pretty much everyone get that notification? This is completely the wrong place for a question like this. Check out FAQ on usajobs.gov or other forums on the web for information about getting hired as a wild land firefighter. Get in touch with those individual crews (http://www.fs.fed.us/fire/people/hotshots/IHC_index.html). The three crews you mentioned are all in different regions so pretty good chance the start dates will differ slightly. My experience in region 4 (never on a shot crew), start dates were early to mid May. As far as being rated qualified and referred, I believe it means that your application has been passed on to these crews; basically you have passed the first round of the hiring process. Different duty locations (Vale, OR, Susanville, CA, etc.) pull applications at different times – you can look on usajobs under the specific application to see when specific crews pull applications, aka “first consideration date” (good chance if you applied to other crews, that you will get referred to them as well when they pull their applications). It is not uncommon for crews, especially hotshot crews, to get hundreds of qualified applicants. The best advice I can give you is to get on the phone, call around, and see what crews are looking for a person like yourself. They are usually more than happy to answer any questions that you might have and it is a good opportunity to get your name out there. They might ask you some questions, physical fitness and experience wise and most crews keep a log of communication to see who is really interested, who really “wants the job”. I’d advise you to keep a log yourself and keep in contact with the crews you are most interested in. what is a good hill in Arizona that meets the aforementioned requirements? Personal favorite of mine is Piestewa Peak (formerly Squaw Peak). It’s easy to access (right off of the 51, around Glendale Ave). The summit trail is about 1.2 miles up, with an elevation gain of around 1,000 feet. It’s a stair climber. In good shape, loaded up with a pack doing it around 30 – 35 minutes is pretty darn good. Round trip, you should be down and back in less than an hour. IMO – it is the best training hike in the valley. It definitely gets busy, so hit during off-peak hours to avoid the inevitable bottle necks caused by out-of-shape snowbirds. Camelback Mountain is good as well. For a longer hike, head out to the Superstition Mountains, and do the Siphon Draw Trail. It’s a tough one. How many times a week should i hit Piestewa Peak up to get ready for the season? Thank you in advance, Mike. I would say 2-3x week and you’ll be good. Vary your pack weights, and vary your pace. Also if you’re feeling sporty – toss in a few push-ups along the way (wear gloves if you do that – the trail is littered with cactus!). A good test – if you can do Piestewa Peak twice in a row with a 45lb pack, you’re going to be in great shape for Fire Season. Don’t listen to Nards. Here’s the workout program to get you get ready for a hotshot season. Saturday-Listen to Kenny Chesney with your shirt off. Sunday-Listen to Florida Georgia Line while wearing a flat brim hat. Also, be sure to put a cool fire helmet sticker on your Tacoma Pre-Runner. Preferably one with a cool flaming skull and some kind of play on words phrase which clearly conveys you’re a firefighter. I have a question, on the chart are Mondays, Wednesday and Fridays run days? Is that what the 2 mi, 3mi…Etc indicates? Unfortunately, I’m limited to flat land around me, some hills, but nothing to write home about. I’ve been training with a 45-lb vest on the treadmill, cranked to 15-20% incline x 45-60 minutes, along with trail running for cardio. I guess the treadmill is the best I can do without nearby mountains or hills? Thanks for your input. what are the days where it says intervals on the chart? Also on the chart what is the Hill Workout? I would really appreciate your help. Thank you.